Today, it's our honor to share with you a different variety of wedding. Thirteen years ago, David was a sous chef at a P.F. Changs and Andrea was a server there, awaiting the results of her bar exam. They started dating that winter, and when David was promoted and relocated from Ohio to Iowa, Andrea--a non-practicing Catholic at the time--came with him and they moved in together. Four years later, they were husband and wife. In all things grace abounds. 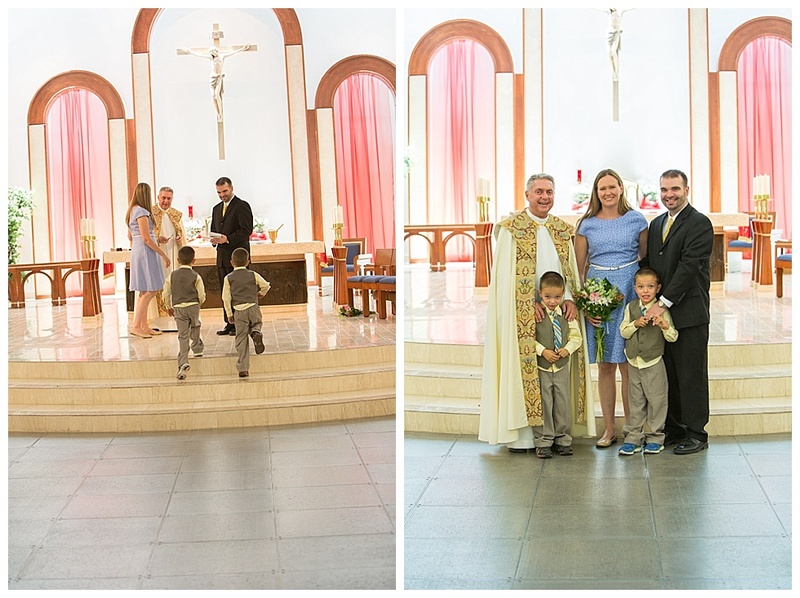 This is the story of Andrea and David's journey to the Catholic faith and the day they had their marriage convalidated by the Church. From the Bride: This isn’t going to be your traditional Catholic love story. Not even close. The Lord sure is funny. The way our stories are intertwined into a one great tapestry; one we can only hope will be fully revealed to us on the glorious day we are reunited with Him. He certainly has a grand sense of humor. In fact, that’s all I could think about when an early ultrasound one year ago revealed that there were 2 little bouncing beans hanging out in my womb. Again. Twins happen twice. That’s my new favorite hashtag. After a pretty harrowing birth at 28 weeks, our newest babes are now approaching their first birthday. It was quite the journey to get to this place and to be at peace with all the blessings the Lord sees fit to give us. Against all odds, David and I were married in a beautiful, intimate outdoor ceremony on September 22, 2007 that was officiated by my Uncle Tim, a Christian pastor. We discovered we were pregnant in December 2007 and one month later, much to our complete and utter shock, learned we were expecting twins. With no family history of twins and no assistance through fertility treatments, this unexpected twin pregnancy was quite the surprise. Their birth day was extremely traumatic and I very nearly lost my life. Hayden and Logan were 2lbs 6oz and 2lbs 5oz at birth. After 71 days in the NICU, they finally joined us at home. While my physical scars from their birth healed relatively fast, the emotional scars took much longer to mend. A deep fear of another HELLP-related pregnancy and fear of death led me to choose an IUD for contraception shortly before their discharge. For all intents and purposes, my husband and I were finished having children. 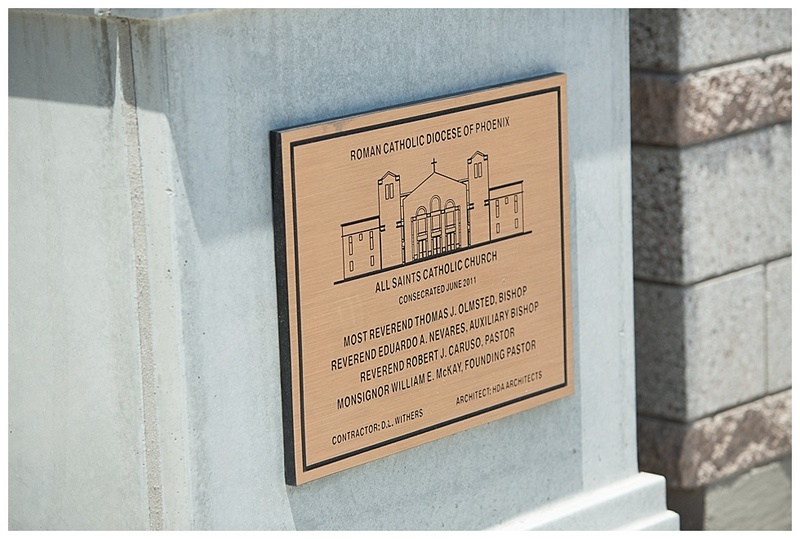 A series of events that can only be described as divinely inspired led us to Arizona in 2009. In order to be closer to my parents, we decided it was the best place to be with our growing boys. David was able to secure a lateral transfer with PF Changs, we sold our home in less than 30 days, and we found a rental home five minutes from my parents. As you are reading this, you may be curious as to why there is no mention of God throughout these experiences. The answer is simple. God didn’t matter to me, and he hadn’t mattered for nearly 13 years. My family converted to Catholicism when I was 14 years old. And while I faithfully attended Mass each weekend until I left for college, I never really got it. I didn’t understand the beauty and the magnificence that is our Catholic faith. I had no passion for the Lord and certainly had no relationship with him. So it should be no surprise, given my ambivalence, that when the Mormon missionaries came knocking on my door during an extraordinarily self-destructive period in my life, I let them in. In August 1998, I abandoned my Catholic faith and joined the Church of Jesus Christ of Latter Day Saints. My conversion served its purpose and I fully believe the Lord used this to save my life. I was an active practicing Mormon for one year, and then I just wasn’t. There was no big break up, no dramatic exit; I just stopped going. I continued to identify as Mormon for a couple years and then began to label myself as a Christian. Despite many attempts over the years to bring me back to him and His Church, it was the death of a young Catholic wife and mother whose online journal had me re-thinking everything I thought I knew about Catholicism, life, death and suffering. A brief Google search revealed Robin's journal, where I learned she had passed away from a rare form of cancer. 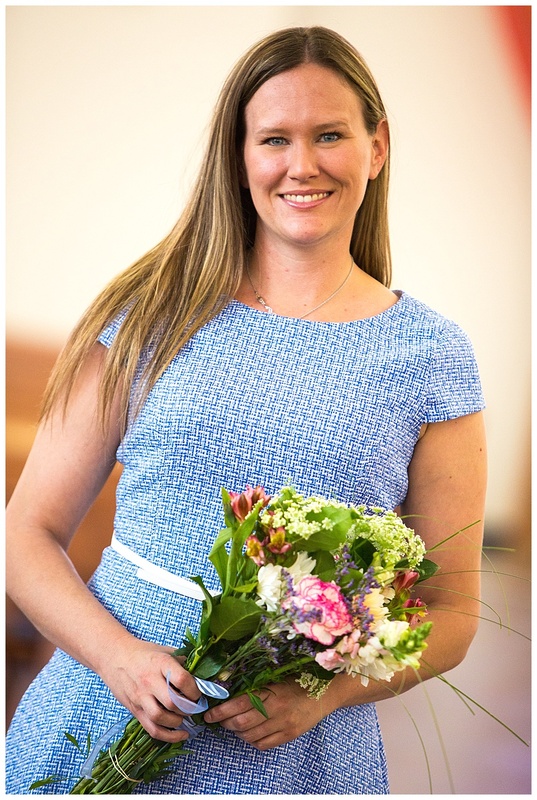 Only 32 years old, my former law school classmate, a faithful Catholic, a wife and a mom of two girls was gone from this world. Her journal shook me to the core. After reading through it, I knew immediately that I had to return to the Catholic Church. I scheduled my confession and began attending Mass. 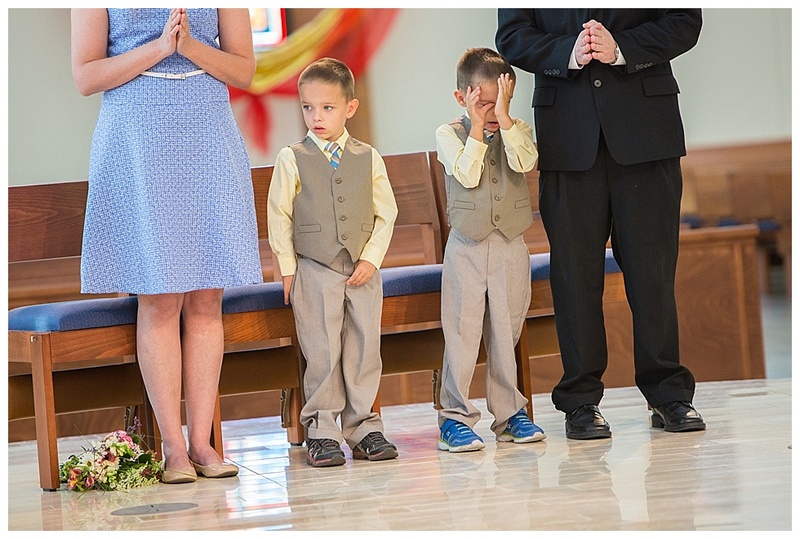 Because I wasn’t quite brave enough yet, each Sunday morning my husband worked and I'd drop my three-year-olds off at my parents' and go to Mass alone. 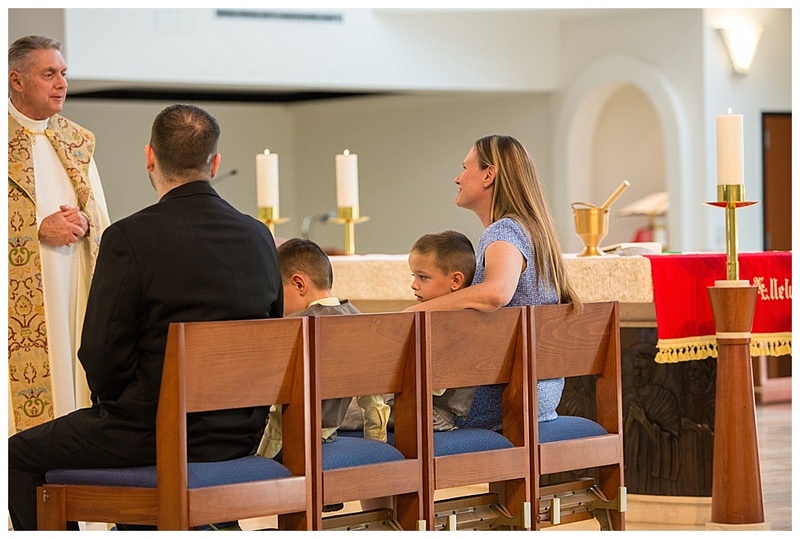 I would gaze longingly at the families I saw and would always tear up when the kids were dismissed for Children’s Liturgy. Occasionally, David would join us. 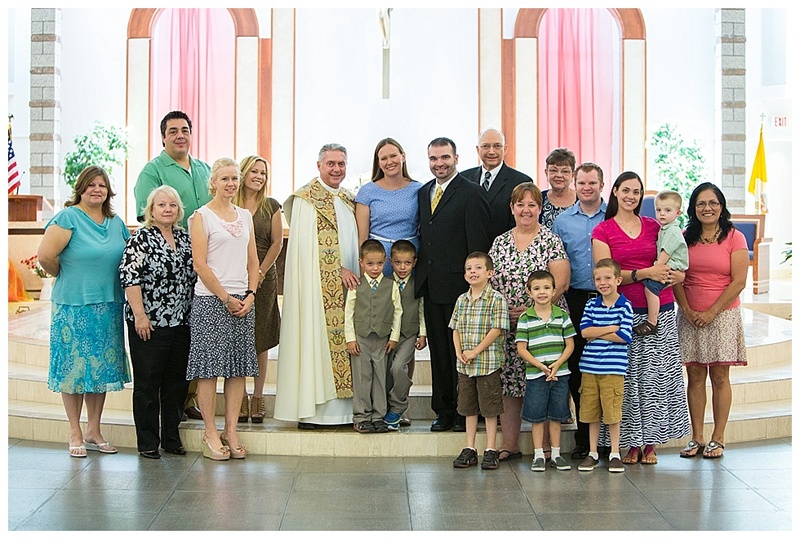 I felt very blessed the Sundays we were together at church as a family, even though I never thought he would become Catholic. My physical return to the Church was relatively easy, but my acceptance of her teachings was not. I struggled deeply on many issues, specifically artificial contraception. It took a lot of prayer, and what I can only describe as a lightbulb moment of clarity, for me to comprehend the teachings, and to ultimately become open to life again. Despite this clarity and certainty, it still took well over a year and a half for me to overcome my fear of death and pregnancy and to finally have my IUD removed. My husband, well, wasn’t exactly on board with the decision to stop using artificial contraception. As a matter of fact, he was adamant that if I chose to remove the IUD then a vasectomy was his next move. 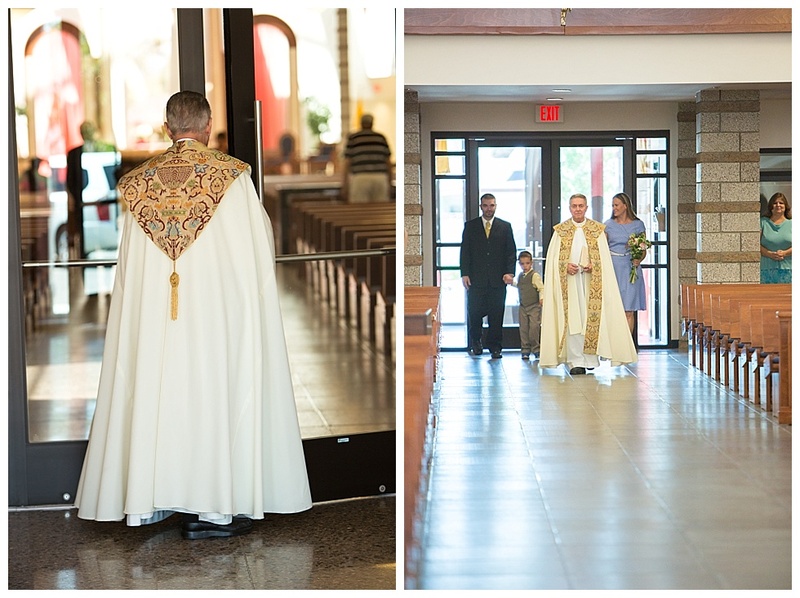 He was fine with my return to the Church and attended with us whenever his work schedule permitted. But he was not okay with more kids, simply because he feared I would not survive another pregnancy, leaving him behind to raise our children without a mother. It was during these discussions with my husband that convalidating our marriage began to weigh heavily on my mind. 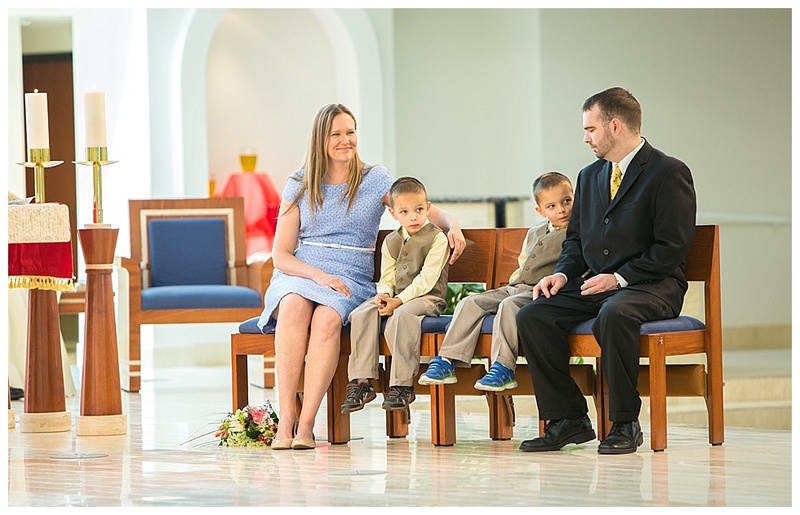 About eight months after my return to the Church, our family’s sacramental journey began with the baptism of our twin boys. I knew we should have our marriage convalidated, but I had been putting off the discussion. One day, I just took a deep breath and asked. I explained what it was and why it was important to me. Much to my surprise, David said yes and the process began. On May 18th, 2013, our convalidation ceremony took place. It was a beautiful, holy day full of blessings and graces. My husband, though not fully understanding the importance of it, said Yes to me again, and I to him. Only one week prior I'd had the appointment to remove my IUD. Just that day, David again reminded me that if I did this, he would be getting a vasectomy. I went to the appointment filled with anxiety and fear. Because I had specifically chosen a Catholic OB/GYN, peace overcame me and when the PA offered to pray with me, I begged the Blessed Mother to cover me with the peace of Christ and offered at least 30 Hail Marys during the appointment. 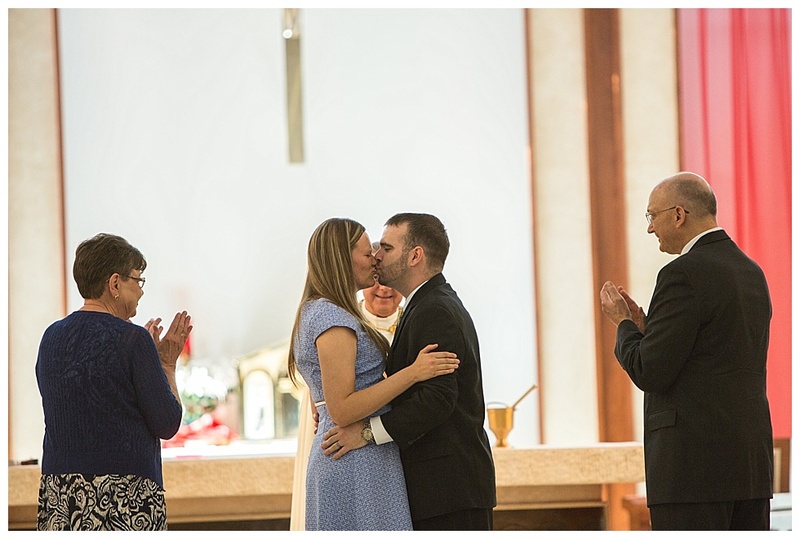 After our ceremony, we began our Natural Family Planning journey, which I only half-heartedly embraced. I kept waiting for David to tell me that he had scheduled his vasectomy. I was waiting all the way until October 2013, when I saw that little plus sign on the stick signaling new life. Our daughter Olivia Grace was born on my birthday, May 27. 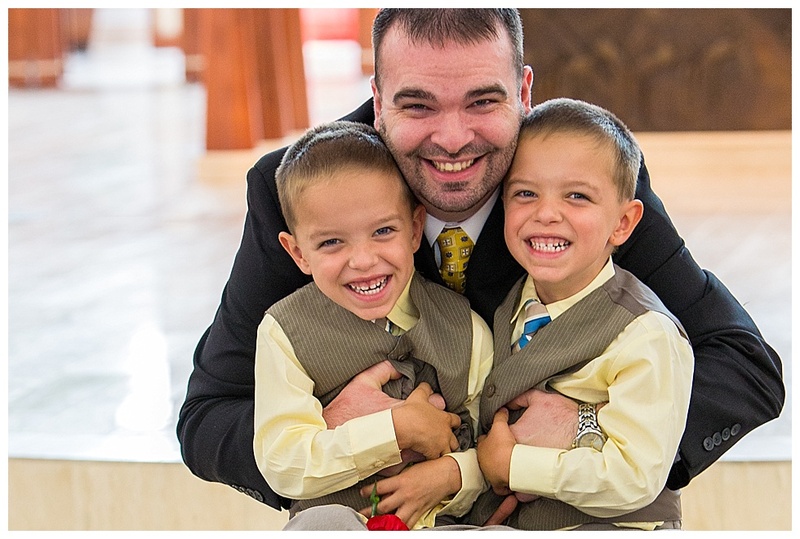 When we discovered we were pregnant, I shared with David my concerns about going to Mass alone with two six-year-olds and a baby and asked him to arrange his work schedule so that he'd be able to attend with us each week. 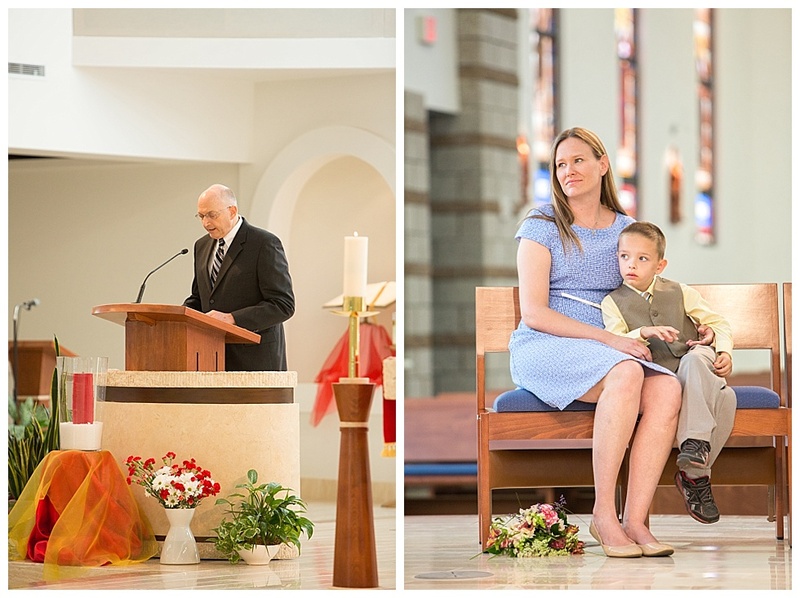 So after Olivia's birth and 2.5 years after my return to the Church, one of my deepest hopes had come true: my entire family was together during Mass each Sunday. Only three months after Olivia's birth and one month after her baptism, they announced the upcoming RCIA program at our parish. My husband looked at me and said, “I think I might do that.” He left me completely and utterly speechless for the first time in my life. 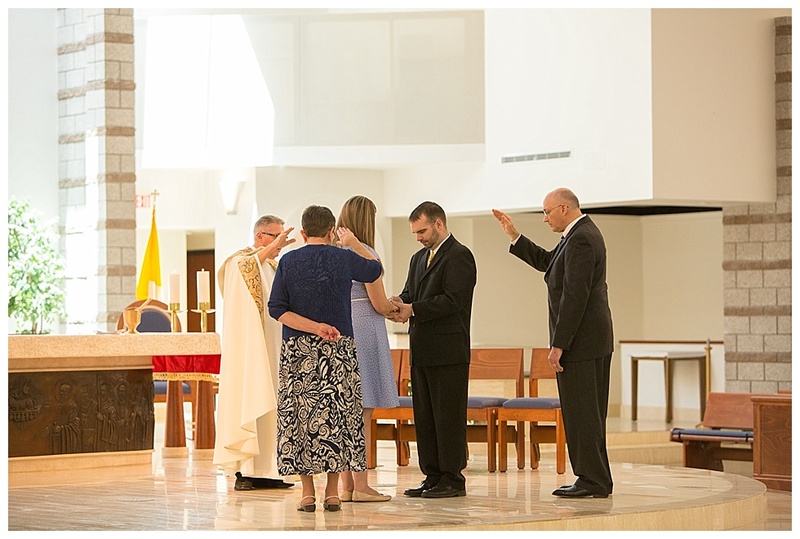 On Saturday, April 4, 2015, my husband was welcomed into full communion with the Roman Catholic Church through the sacraments of Baptism and Confirmation. Since David hadn't been baptized at the time of our convalidation, our marriage wasn't yet a sacrament--although it became one, praise God--at the moment of his baptism. And while we didn't receive any sanctifying grace that day, the actual grace was abundant. I have no doubt the Holy Spirit began working on my husband’s heart. He may not have understood the reasoning behind the ceremony, but he surrendered out of his love for me and for our family, thereby allowing the seeds of his conversion to be planted. This grace also stopped the quest for a vasectomy in its tracks and began softening David’s heart to the possibility of more children. And although my second deepest fear was realized with the premature birth of our second set of twins and their 53-day NICU stay, the journey was far more peaceful and grace-filled than our first journey. The Lord was with us every step of the way and I relied on my husband’s strength and faith when my own was lagging. A faith that began on May 18, 2013.